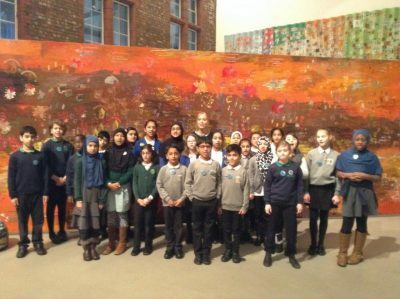 January 27, 2019 by St Agnes Manchester 0 comments on "Peace Ambassadors and Student Council Children join the Manchester’s Multi-Language Mushaira 2019 Creative Crew"
On Thursday 24th January, as a part of our Peace Mala and Rights and Respecting work, three of our Peace Mala Ambassadors and three of our Student Council joined a number of other schools in the local area, to begin an exciting new art project! The project we are taking part in has be planned to celebrate how wonderful it is that over 200 languages are spoken in Manchester. The project will also mark Mother Language Day on the 21st February! The children who were selected were chosen to represent our school in a Poetry and Arts Event. They were seen as role models for others and promoters of acceptance and tolerance. Something that we expect of all of our children, an important element of our Peace Mala Values. The project is called ‘Manchester Multi-Language Mushaira’. Traditionally, a Mushaira is a spoken-word poetry event performed in Urdu. But poetry created for this Mushaira will be in any language, including English. As we are a school with 15 spoken languages, we were extra keen to be involved. 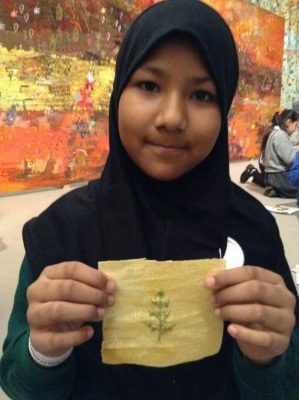 Although, most children at school will be writing poetry for the event and making a huge piece of artwork that will be displayed at Whitworth Art Gallery, these six children were chosen for an extra special opportunity to attend a workshop at Whitworth Art Gallery and a number of other events. These children are now members of our school’s Creative Crew and will be performing live at the Mushaira Event at Longsight Library, on Thursday 21st February 2019. 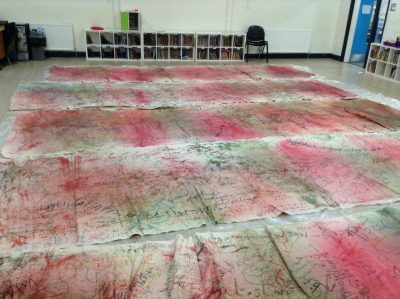 Over the next few weeks, they will also be working with a poet and two artists in preparation for the event. Public speaking is a very brave thing to do when you are only 9/10 years old. We are extremely proud of the children involved. 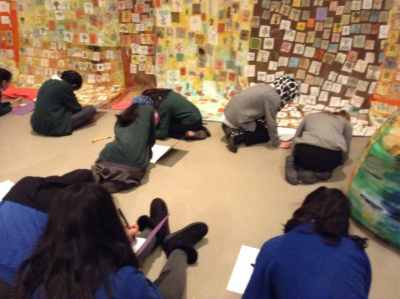 On Thursday, the children visited Whitworth Gallery and met the Crafts Council (children from Stanley Grove, Rushford and Longsight Community Primary and worked with textile artist Alice Kettle. 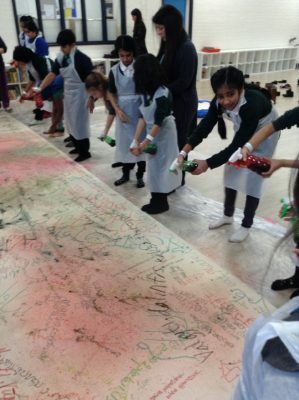 In the afternoon they worked at Stanley Grove Primary Academy to make giant art works to decorate the Mushaira, decorating huge pieces of fabric with the different languages spoken in Manchester. The messages were based on the importance that is placed at meals times in all homes and for all cultures/faiths, to eat, share, talk and care. 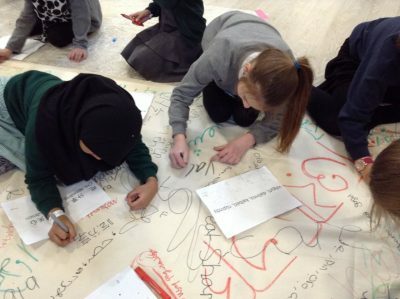 Writing eat,share, talk and care using all of the languages that are spoken in Manchester. The messages were based on the importance that is placed at meals times in all homes and for all cultures/faiths when sharing their understanding of the world at the dining table. Acceptance and Tolerance for All!